And happy new year! We had a nice Christmas and hope you did too. 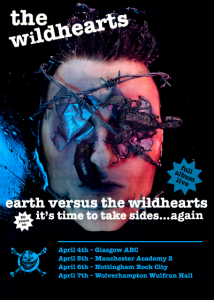 More interestingly, we’re doing some dates with The Wildhearts in April. We’re supporting on their ‘Earth Vs’ 20th Anniversary Tour, which will be brilliant, right? They’re doing two sets: one Earth Vs and one with a load of other stuff. Brilliant. These are four of our favourite venues and we’ve got a great set of old and new stuff for you. The new album will be out by then so hopefully you’ll know the words. In other news, it’s Pure Rawk Awards time again – having done rather well in previous years, we kind of hope we might this year too. We’re up for Best Video (with our pals at AshTV), and Dave is up for ‘Axe Hero Of The Year’. Which he surely is, so get voting if that’s your thing. We’re always very aware of not asking you to vote for us in every single thing, as music isn’t a competition, but the way we feel about the Pure Rawk Awards is that we should let you know about it and you can decide from there. As much as anything, it’s a vote for independence. Anyway, lots of categories and lots of good music in there, so have a look. The new album recording is going immensely well, and we’re hoping to have something to play you at the end of the week. We think that’s about it for now. We’re finalising tour dates for April and May at the moment, so those will be up forthwith. All the best, and hope to see you at a gig. This entry was posted in Gigs, News, PledgeMusic, Pure Rawk Awards by webmaster. Bookmark the permalink.